Nearly three decades ago, at the onset of transition, ex-socialist countries’ enterprise sector was lagging severely behind that in the developed West – machines, and technology more broadly, were largely obsolete, labor productivity low and managerial techniques inadequate for a modern economy. Restructuring of enterprises i.e. installation of new technologies, improvement in quality of products, introduction of new processes, upgrade of the labor and management and exploration of new markets was crucial for the success of transition. While early macroeconomic policies were designed to address macroeconomic disequilibria, they in combination with policies for micro-level adjustments were to conduce to enterprise restructuring. In many transition countries, foreign direct investment (FDI) was the key solution towards the task of enterprise restructuring. This was because – at the inception of transition and ensuing first years of reforms – there was a severe lack of capital, inadequate domestic technology and underdeveloped managerial talent. This demand for FDI capital led to a huge inflow of foreign direct investment to the transition countries when literally hundreds of billions euro worth capital led to acquisition of a substantial share of domestic productive capacity in these countries. Relatedly, some numbers will demonstrate that – in a small economy of Estonia by 2017 cumulative inward FDI reached nearly 90% of its GDP (net position being 61% of GDP). 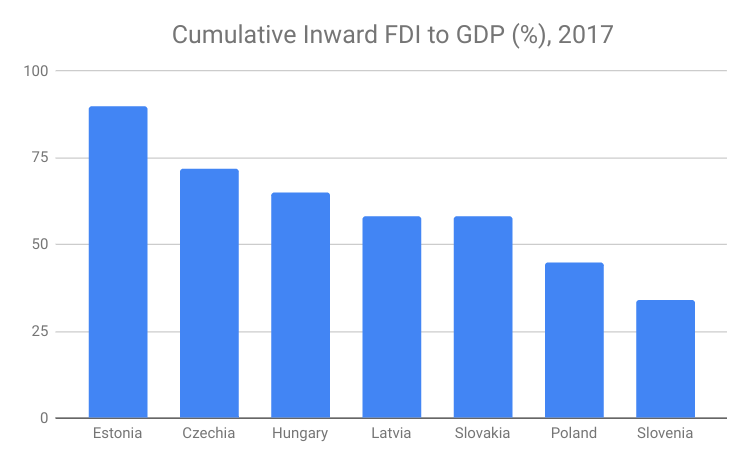 Other countries became significant hosts of FDI as well – inward investment in Czechia were 72% of GDP while that in Hungary was 65% of GDP by 2017. It seems fair to say that up to now the FDI has been the main driver of growth in most post-socialist countries. However, these countries have matured by now – a pool of managerial talent has grown both by quantity and quality, countries have been integrated into international sales chains, capital for sound projects is available from private equity groups or banking sectors. Domestic R&D and science have moved closer to the world’s frontier in some countries and the quality of managers and other experts is such that the technological know how can be imported easily. In other words, investment landscape in at least most advanced countries of the region has changed and is conducive to formation and growth of world competitive but domestically owned companies. Hence, it seems that at the end of 2010’s the big “growth” question is which model of growth to promote ? To further a model based on FDI or attempt to nurture domestic enterprises ? As often-times is the case, the middle road will likely deliver the best results. FDI still brings most modern managerial know-how and corporate culture, tested processes, high quality products and connection to existing markets – all valuable attributes of a modern enterprise. It would be a mistake to discourage their inflow. However, should generous FDI incentives be kept in many countries or these resources be rather targeted to creation of domestic startups and existing companies ? To be sure, domestic companies have certain advantages too. First, large domestic investment groups/enterprises are probably more keen to invest in public goods than foreign-owned enterprises. Things like very local infrastructure, education, culture or sports – investments that have spillovers – are much more likely to be supported by local big entrepreneurs than by branches of large multinational companies. Second, at times, domestic policymakers may want – through a moral suasion or otherwise – coordinate with a private sector and in such cases domestic entrepreneurs will more likely be brought on board to cooperate. Last but not least, as Prof. Dani Rodrik1 reminds us, FDI ownership shifts the bargaining power from labor to capital leading to lower wages on a company level (and may lead to lower labor/output ratios in the whole economy). In extreme case, detachment of labor from the companies in combination with perceived unfair wage treatment may lead to backlash against foreign ownership as such. A legitimacy of the current highly integrated economic system might be called into question as well. From this point of view, a more balanced economic structure – one in which both foreign and domestic enterprises co-thrive – seems to lead to more sustainable economic model. Hence, given limited resources available, it might make sense to earmark some share of resources yet devoted for FDI incentives for the support domestic start-ups instead. Given that typical start-ups do not require much funding, a relatively large number of small starting entrepreneurs could be thus supported. One way to accomplish this is through a independently run fund with multi-source funding – perhaps partly private charity sponsored – from which the entrepreneurs could petition a support or via which various other schemes of support could be administered. Only a small share of funds hitherto available to huge FDI projects and redirected to small business could make a big difference to many individuals. The support of start-ups or small entrepreneurship would have an added advantage of pulling employees into entrepreneurship thus converting them into “capital-owners” with positive implications for social mobility, distribution of income and nurturing of entrepreneurial culture in these countries. Furthermore, this all could work as a potential recipe against the backlash against the current economic system which in its nascent form seems ubiquitous at many corners of the world. Is the advanced East as rich as the Southern Europe? As a regular visitor and keen admirer of Andalucia of southern Spain or Crete of Greece I not only get enchanted by the marvels of the two vacation heavens. Being an economist from an ex-socialist country, I also like to keep my eyes open to gauge the contrasts and differences between my home country and the European South, cultural as well as those related to the respective economies. A perusal of various statistics of the real economic performance of the Central Eastern European countries and the European South – here defined as Italy, Spain, Portugal and Greece – suggests a substantial level of convergence of the former to the level of the latter. While in the early 1990’s – at the onset of transition – the CEE countries lagged substantially behind all Western European countries, now the picture is very different. In terms of the economic output adjusted for prices (PPP) the most advanced countries of CEE such as Czechia with 89% of GDP of the whole of EU and Slovenia (85%) have overtaken Portugal (77%) and Greece (67%) while are nearing the level of Spain (92%) and Italy (96%). Does it mean that the most advanced countries of CEE are about 10-20 % points richer than Greece/Portugal and about 5-10% points poorer than Spain/Italy ? Does it mean that – with a bit of simplification – we can claim that the level of riches in the frontier CEE countries have reached those of the European South ? While it is useful to count on the official statistics to paint the picture of overall riches in these countries, any visitor to the southern Europe vs CEE will make his own assessment on the basis of local incomes, prices and visual surroundings and probably conclude that something does not quite dovetail. Why ? This article will put in a sharp contrast comparison on the basis of measures of real economic activity vs comparisons which includes the effects of price levels as well as accumulated wealth. The fact that CEE countries are normal, in parlance of Prof. Shleifer1, in a sense that they are coping with issues of typical market-based economies is well established. From this view angle the TRANSITION is over – but is the CONVERGENCE process really nearing its completion (when numerically compared to the European South) ? From the point of view of wealth abundance, are really advanced CEE countries approaching the riches of the southern EU countries ? As with many statistics in economics, here also it is instructive to note a difference between flow and stock indicators. The Gross Domestic Product – a value of all goods and services produced on the territory of a given country within a year – is clearly a flow variable. When a comparison is made on the basis of GDP adjusted for prices we compare the level of economic activity in real terms. Since what gets produced, gets distributed, this also says something about a standard of living in countries. In this sense, Czechia/Slovenia are not far from the best performing southern countries (Italy/Spain) while their real GDP is higher than that of Portugal and Greece. While the real GDP is a construct of economists who in cross-country comparisons adjust for differing prices, the actual GDP that is produced in economic life is nominal.On an individual level, prices one sees in shops are nominal, wage an individual receives is nominal. On a company level, sales are nominal and so are the investments, for instance. On a country level, current account balances, debt levels or investment flows – all of these indicators are also of nominal variety. In other words, the world in which individual participates, the one he can touch is nominal. This fact that the actual economic life is “nominal” is oftentimes neglected by economists who overly work with their analytical constructs which adjust for prices, they talk “real” variables. However, for instance, when one thinks about the national economic power, the nominal GDP is much more useful concept than the real GDP. Investment flows that help some countries grow or outflow of which can devastate others are kept on records in nominal figures. Price signals that transmit crucial information throughout the economy, which are important for decisions of consumers, firms and other entities are also nominal. In other words, the real world seems to be nominal. Hence, in cross-country comparison, there is a clear need to look at GDP figures also before adjustment is made for price differences i.e. GDP in nominal figures. Because of much less competitive production structures and ensuing foreign imbalances, many of the CEE countries had to put up with severely undervalued currencies at the inception of transition. Hence their price levels at the beginning of transition were much lower than those prevailing in the West (for instance the price level of the Czech economy in 1995 was 38% of the EU level). Even now, nearly three decades after the transition started, prices in CEE countries are much lower than in the Western or Southern part of the EU. According to Eurostat, in 2017 the Czech price level was only 67% of the average price level in EU while that in Slovenia was 82%. Prices in Portugal (82%) / Greece (89%) and those in Spain (91%) and Italy (99%) are above the level in CEE countries. On the basis of these statistics, it seems that convergence in real output has outpaced the convergence in prices in CEE. The result is that “the nominal world “ – which is the the world a visitor from the East sees when visiting South – is “scaled up” nominally in the South compared to the CEE region. In order to hammer this analytical point home further, make the following thought experiment. Both a hypothetical country East and country South have the same real GDP per capita (and, say, same labor/output ratios and similar conditions on labor market – this should imply same real wages). However, the country South price level is 30% level higher (nominal wage of worker from South is 30% higher). Would workers of both countries “feel” the same rich ? The argument could be made that visitor from East to the South is worse off than it is in the opposite case, for obvious reasons. Everything being scaled up by 1.3 factor, the South is more expensive for the visitor from the East than is his home country. Obvious implications follow. As mentioned above, price levels everywhere in Southern Europe are higher than those at most advanced CEE countries. This contributes to one’s skepticism about the claim that “the East has nearly reached the level of wealth abundance of the South”. A comparison of GDP in nominal figures for the six countries, as in the table below, further brings this point home. For instance, Italy and Czechia are much further apart in this comparison; the latter country is behind Portugal. Even more important than the “nominal or price effect” is the issue of differences in the accumulated wealth. In flow/stock parlance, accumulated wealth is clearly a stock indicator. According to Credit Suisse, in 2018 the average wealth per adult in Italy was 217,787 USD, Spain 191,177 USD, Portugal 109,362 USD and in Greece 108,127 USD. This is substantially more that 79,097 USD in Slovenia and 61,489 in Czechia. 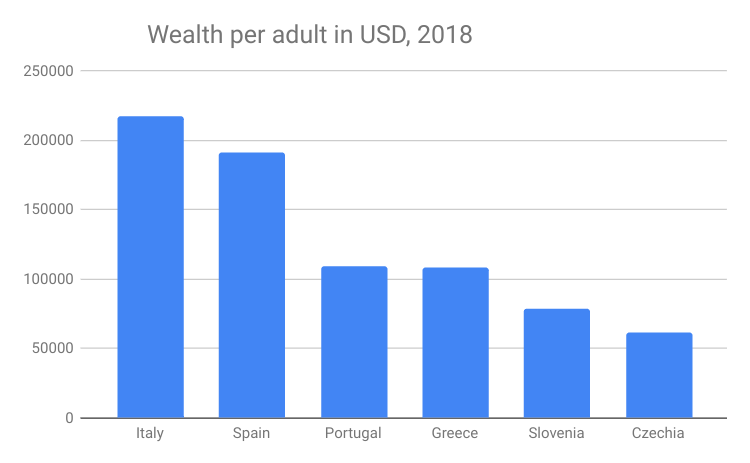 It seems that the advanced countries of CEE are nowhere near the wealth levels compared to the South, be that poorer countries like Portugal or Greece or richer ones like Italy and Spain. This is the second explanation for a much skepsa that the top CEE countries are near the Southern countries in the level of their riches. A more thorough inspection and analysis of economic statistics suggests that the level of convergence of the most advanced CEE countries in prices has not progressed as far as the convergence in real economic activity. Furthermore, differences in wealth likely due to the fact that southern countries have had market-based economic systems for longer that the CEE countries leads to a further explanation for lower perceived wealth abundance of the CEE vis-a-vis the European South. This answers the question posed at the beginning of this narrative whether the advanced CEE countries reached the level of riches of the South to the negative. Nevertheless, the expected continued convergence in the future is likely to further reduce over time the differences between the CEE and the South, both in income and wealth. Pro-growth agendas to gain traction in CEE ? The convergence of the formerly socialist countries in terms of economic output to the level of developed West proceeded at an uneven pace as the countries’ initial conditions and transformation strategies adopted by policymakers differed. This resulted in often vastly differing output and other economic outcomes’ trajectories. The Eurostat data show that the most advanced countries of Central Europe such as Czechia, which reached the level of 89% of GDP per capita in normalized prices (PPS) of EU(28) in 2017 or Slovenia (85%) are nearly closing the gap with economically advanced nations of Europe, at least in terms of the economic output. A study by UniCredit Slovakia economists 3shows that sector-level adjustment was also rapid in the advanced countries of Central Europe and convergence nearly completed in the sector level structure. When comparison is made within sectors, however, more needs to be done so that these countries come yet closer in production to the productivity frontier of the advanced West. Other countries, such as Estonia (79%) , Lithuania (78%) Slovakia (76%) and Poland (70%) are also making a rapid progress in convergence. Interestingly, the most advanced CEE countries are already reaching levels near – Italy (96%) and Spain (92%) – and are above southern European old members of the EU such as Portugal (77%) and Greece (67%). The further rapid convergence is predicated on the ability of the CEE countries to generate investment, be that of domestic source or FDI, further enhance the quality of their work force and to reduce a technological gap with the advanced economic nations. Although at a slower pace than during the decade in the run-up to the financial crisis in 2008-9, the CEE countries have been growing briskly this decade. According to Focus Economics, the growth in the EU(11) countries – eleven post-socialist countries of EU – should be 4.1% this year. However, the cyclical upturn is reverting to a close in the CEE region as the expected Eurozone slow-down, labor bottlenecks in some countries, potential fallout from Brexit as well as monetary tightening will bring easing of the economic growth in 2019. The overall economic growth of the EU(11) region, according to the forecast of Focus Economics, will be 3.4% with Slovakia claiming the leading position with expected 3.7% annual growth ahead of Poland with 3.6% growth. With growth in the region on the taper trajectory, further need for adopted pro-growth agendas seems imminent. According to the study by McKinsey Global Institute4 an explicit pro-growth agenda adopted by governments seems to be one of the crucial supporting factors of the long-term economic success , at least when one retrospects the growth record of countries over the last fifty years globally. 1.) Business Environment. Perhaps because of a lack of domestic capital, technological know-how and developed managerial talent, the economic growth of most countries of CEE was largely driven by foreign direct investment (FDI). While very supportive of economic growth, in the longer term, an FDI-based growth model alone does not seem to be an optimal one. More balanced economic structure is needed should the countries rapidly climb the value ladder in the longer term; company headquarters rarely relegate the highest value-adding economic activities to recipient countries. The notion that there is a need for a balanced economic structure beyond the “FDI model” is further implied by the study of McKinsey Global Institute which highlights the importance of domestic corporate champions for the sustained rapid economic development. Measures such as reducing administrative burden for entrepreneurs, eradicating obstructive regulations, minimizing red tape/ corruption and putting certain public services for entrepreneurs online would go a long way towards supporting the growth of small business. Public-private partnerships in the area of start-ups and R&D could further lead to nurturing small business/SMEs and be a push for development of technologically advanced firms. This would all conduce to a higher likelihood of bringing to life national corporate champions that could spearhead regional or country-wide development one day. 2.) Institutional Framework. Importance of institutions for economic prosperity of countries is well established in economic literature, most owing to Prof. Douglas North. Property rights and contracts need to be well defined, fairly and predictably enforced for production and commerce to flourish. This area gains further salliance in the countries of former socialist block as the institutional frameworks underpinning their socio-economic systems needed to be fundamentally revamped. Their constitutions had to be re-written, commercial code re-introduced/redesigned and other important laws adopted or changed. Judiciaries, public administration and other executive bodies were in need of a reform. No doubt, the fast-evolving global economy and its trends mean that laws in the CEE countries need to be constantly adjusted or newly written too. However, going forward, it is mostly the reforms of the public sector organizations which pose policy challenges as they will require concerted and detailed effort, oftentimes bear political costs and do not present policymaker with much low-hanging fruit. Nevertheless, in terms of public welfare enhancement – since these reforms would conduce to both efficiency and economic growth – the area of reforming institutions, bodies enforcing them and other public sector organizations is of enormous significance. 3.) Human Capital. A continued upgrade of human capital of the CEE countries would likely significantly contribute to speeding up convergence and reaching higher level of prosperity. While benefiting from the legacy of relatively good schooling under socialist regimes, the current educational systems of the CEE countries are no longer keeping abreast with the modern standards and mostly lagging behind those in the developed West. For the countries to speed up convergence, they will likely find in their benefit to improve the formal educational sector and incentivize the development of the sector of lifelong learning. Particularly, university and other higher education sectors merit further attention – currently it seems that the foreign owned business sector is substituting for local universities and higher learning in shaping relevant skills of employees in many CEE countries. Should countries have aspirations to further climb the value ladder in production, improvements of the R&D and higher learning sectors seem vital. Particular countries’ strengths, available resources and traditions should decide whether to focus only on applied research or to attempt for breakthroughs in advanced basic research; that overly generous flow of resources to the latter could bring inefficiencies cannot be over-emphasized here. Given the fast technological progress and an ensuing changing demand for extra skills, lifelong learning is becoming quintessential for continuous upgrade of labor force, more reasonable income distribution and future productivity gains. An access to quality business education not only via full-time degree programs but also, or especially, through executive and evening/weekend business programs would lead to nurturing of specialized expertise / managerial talent so needed to enhance the economic value of the output and to support local entrepreneurship in the CEE countries. Targeted tax incentives could help increase resource flow to the whole sector of lifelong learning in the CEE countries. The year 2019 will likely see an economic growth slowdown in the region of Central and Eastern Europe (3.4%). Further forecast easing of the growth in CEE is on the horizon in 2020 (2.9%). Recent policy research results, which point at importance of explicit growth agenda adopted by governments for a development success juxtaposed on the expected slowdown of economic growth across the globe will likely bring a theme of pro-growth agendas to the fore everywhere, including CEE. Assuming clairvoyance on the part of policymakers in CEE, should these countries aspire to keep their convergence tempo from the past, explicit pro-growth agendas – addressing the key themes of business environment, institutional framework and human capital – might gain traction in the near future. 2.) Shleifer, Andrei, and Daniel Treisman. 2014. “Normal Countries: The East 25 Years After Communism.” Foreign Affairs. As a visitor, I have come to New York again excited about the usual marvels of this City. Vibrant people, energizing streets, impressive skyscrapers, and the richest choice of cuisine anywhere . I have been here many times before, but this time it is different. It really is. When in Europe, one constantly hears negative media complaints verging on scare about the current America which completely ignore things that have always made America so great, so unique. Attempting to uncover those is what makes my current trip so special. This time, it is not anymore so much about the posh Fifth and its riches, but more about the real old New York, its atmosphere and its people. Perhaps not so flashy, perhaps sometimes run-down, but real. Intrinsic human quality does not know pretension, it ignores fake and renounces superficial. Maybe this is to what America is gravitating these days – to being more real, at least so it seems to an eye/ear of an observing visitor. And to becoming freer. It is the spirit of freedom without so much heavy-handedness in the air that has made America always very attractive for so many. This spirit and overall meritocratic and tolerant environment give rise to the ability of individuals to pursue their own aspirations and accomplish their goals more freely than anywhere else. Free markets – the key force which made this society amongst the most prosperous of all major ones on this planet – still largely determine where resources flow and what piece of pie working or investing individuals can claim. Maybe a bit of clichè but one that is worth repeating: Take New York City as an example of a self-organized place. No big central authority there but markets organize activity in this huge city so beautifully and orderly. Millions take heed and behave like a Swiss clock without causing chaos while not being much coerced. In the contemporary over-regulated world where lives of us are so straight-jacketed, these are true marvels that make New York, or America more broadly, such a unique place to work and live. More real, still free markets-based and pervaded and inspired by the spirit of freedom – this is how I see America today from perspective of a visitor. The last country of the world where things still make sense. Yes, a popular discourse has it: politics needs to be fixed somehow, political institutions strengthened too. Yet, in my opinion, we are nowhere near the doomsday as many critics of the current America would make us believe, or worse they could possibly preordain. Furthermore, some small improvements in the economic system could improve the long term sustainability of the US as an economic leader among the advanced nations. The current prosperity, which is due to intrinsic dynamism, innovations and resilience of the US economy combined with the adopted pro-investment and tax policies, is leaving some behind in material terms, for sure. A fast technological progress juxtaposed on global markets integration is a driving force of such development of income distribution. This is happening in America as everywhere else on this planet. Without a question, something ought to be done to establish a strong floor for everyone in terms of material well-being. After-all, we are in the 21st century and it would be a shame to let people be hungry, uneducated or ill. However, I believe such aid should come in a form of increased role of private charity, not of welfare state. Various schemes incentivizing vastly larger resource flow to charity organizations could be envisaged. However, on that topic I write more some other time – let other economists churn out some papers on that first.